I Really Need This, NOT! Beginning today, a two-day winter storm is expected to bring a dramatic turn in the weather - in the form of 12 to 18 inches of snow for residents from Livingston to Miles City. Winds between 20 to 35 mph are also expected. "We're looking at some pretty severe weather," said Scott Carpenter of the National Weather Service. I keep hearing people say we need the moisture but I don't think we need it this way. I personally would like to see some warm weather to grow some grass, not get no moisture but it's not up to me to decide. 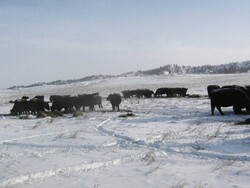 With calving going on the last thing I need is 12-24" of heavy, wet snow to stress my calves and kill some of them. It's going to get rough around here that's for sure. My Darling Wife and kids are moving to town so that school can continue and to be safe from any problems like power outages out here. This is a normal precaution we take with severe weather around here and it usually happens once a year. It can get damn difficult to get out of the place in bad weather and the school does not allow kids to miss school for such reasons and only allows 2 such absences, unexcused, before they will take drastic actions against the students and parents. They keep comparing this storm to the April 3-4, 1955 storm which dumped 4 feet of heavy wet snow in the area. Believe me, this is not what we need around here. Some words from the Billings National Weather Service site. DRIFTS OF 3 TO 6 FEET WILL ALSO BE POSSIBLE IN AREAS. PRECIPITATION AMOUNTS IN EXCESS OF 3 INCHES. Not what we need. The damned thing is there is not much I can do for the cattle to help with this storm, I can't provide them with shelter or much help at all. 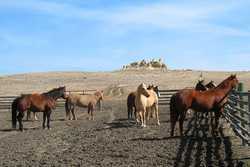 They will manage on their own but I do worry and I will have some losses. I have been feeding close to some brush and draws that provide some shelter from such a storm but I can't force the cattle to use it. 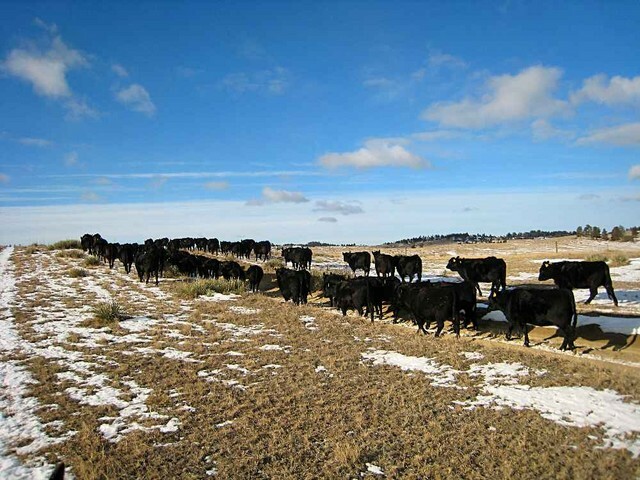 A cow that is wanting to calve usually leaves the herd to calve by herself. 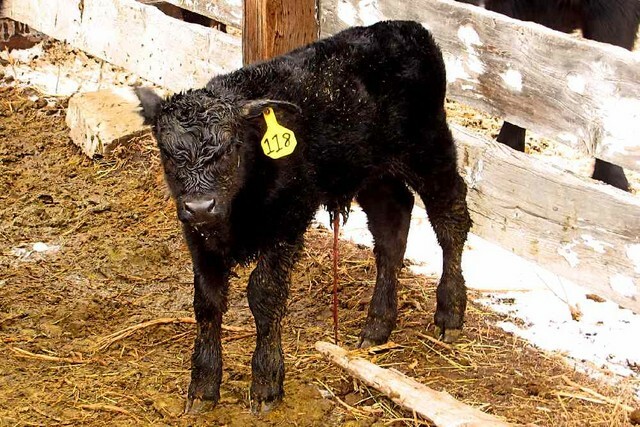 In this situation that means moving to a less protected area to have her calf and risk losing it in an area that doesn't have as much protection. If she stays in the good protection where the cows are at she risk having the calf stomped to death by the other cows that are milling around the area. It makes for a tough situation. If I go out to help, the cow will continue to move before calving and try to find a place where I can't find her. This leads to having it out in the open by accident and losing it for sure. This all sure leaves me in a real bind. 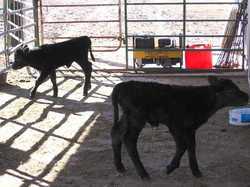 Then consider the calves that are all ready born. The cold, wet snow lasting for two days stresses them which lowers their resistance to disease and sets off an outbreak of scours, guaranteed. With the extended forecast I will be battling this problem for quite a while. If I am lucky I will have no death loss due to scours but it can happen. This is not the kind of moisture we need. A slow, warm rain of about an inch might be useful but 2 feet or better of heavy wet snow is a disaster waiting to happen for me. It's Montana though, you take what you can get. Spring has officially Sprung for me and a new year has begun. The first calf on the cows was spotted yesterday. The cows don't get the attention the first calf heifers do. I knew the cows could be starting any time now so it was not a surprise, nice to see but not a surprise. The tractor tire is still giving me problems. We can get enough air in it to feed every day for now. New tire and tube looks like the answer. Damn the bad luck. It's official. I'm worrying to much. I went out to check heifers about an hour ago and one was calving. I looked at her and thought to myself, "this is going to be trouble, I know it." I did decide to give her a half an hour to see if she would have it but I was sure that she wasn't. I went out a half an hour later and she had made some really good progress, usually it would be enough to give her more time, but this time I looked at her and thought, "those feet are awful big, I can see the tongue but not the muzzle, I just know this cow is trouble so I had better pull it." Normally I would give one like this more time but not this time. I went and gathered up the hand to help me and got a stall strawed down and the barn ready and by then the hand showed up and we were ready to get her in. We walked up to get her and guess what? There she was, standing there, licking off her new born calf. I'm officially worrying to much. It's that simple. Damn, I feel like an amateur at calving after this stunt. I can't believe I did such a bone headed thing. This heifer was so excited to have a calf she didn't know what to do with it. She kept throwing it around with her head and knocking it down she was so excited. I had to get in the stall with her and keep her occupied so the calf, who was really a go getter, could get up to her and nurse. The cow wasn't real happy with the situation but I managed it and the calf got a belly full of milk. Taken 3/01/2007. Every year seems to be a little different and bring something new. This year I might not have many calves yet, three, but the cattle are reacting different. I always like to leave the heifer in the pen she has been in while she is calving. She is comfortable there and more willing to work at calving. Try to move them and they tend to clench up and quit trying to calve and give a person problem. Normally the other heifers don't bother the new mother and baby so it works out great. You do have to watch for another one calving trying to claim the calf all ready on the ground but I usually don't have too much trouble. The last two calves though didn't work that way. They both had the calves on thir own but the other heifers didn't leave them alone. Almost every heifer in the pen had to come check out what that new, wet, wiggly mass was and get in the way of new mommy and baby getting to know each other. Last night the heifer was trying to take care of her calf while trying to fight the other heifers off so they didn't bother her calf. I really hate to have to move them when they are still getting to know each other but what choice did I have. With the weather forecast the way it was, snow, I decided to stall them for the night and call it good. I try not to stall the heifers unless I have to but I did for safety on this one. It's always different around here and different things happen. You never know it all or see it all in this business. Your always learning something new or seeing something new. I guess that keeps us all young, at least that's waht I say to make myself feel better..
On last thing talking about the snow, the National Weather Service forecast had these exact words in it last night. They don't keep it so I can't link it, but I swear I read this. There will be 3 inches of snow tonight and an additional 3 inches of snow on Monday for a storm total of 7 inches. Last time I checked 3+3=6, not 7. I guess this new math is what a college education teaches these meteorologists. I decided last night it was time to start doing night checks on the heifers. They were getting heavy enough that one was going to pop anytime now. I just got in from my 3 am check and guess what? We had our first calf. Heifer number 118 was standing over her calf taking care of it when I got out there. Good mama she was she had it on her own and everything. Time has this really funny habit. It keeps ticking on no matter what. You go on with your daily life and routines and all of a sudden you look up and notice that the month is about over, time has marched on and you almost didn't notice. This happened to me this month. With the daily feeding of the cows and the routine of therapy appointments, doctor's appointments and other routines it almost slipped away. Its time to bring the heifers home to calve and it almost got past me. I realizes the end of the month was coming about Wednesday and I have been getting the few things done here to bring them home. I was considering bringing them home Monday but I am not sure that is going to happen now, I might have to wait until Wednesday to do it. Today while feeding I broke both front springs out from under one of the pickups. Yes, I said both front springs, one on each side. How I managed that is beyond me, but it happened. I am probably going to have to spend Monday trying to get the parts to fix the problem. It will be good to bring the heifers home. I am not looking forward to night calving and the lack of sleep that entails but to see some calves running around will be fun. Time almost got away from me though. I wouldn't have forgotten about bringing the heifers home but that dastardly beast, time sure slipped up quick on me. It tried but failed as it always will. Yesterday morning when we got out to feed the cows I noticed one cow wandering around the feed ground, tail in the air, smelling all the calves laying around and bawling like mad. Quite the unusual behavior for a cow so i went over to check her out and saw that she was trying to calve. An older cow does not act like this if she is trying to calve, she usually just lays down and gets the job done, not wander all over the place so I figured she was in trouble. We finished feeding as fast as we could and kept an eye on her. She was definitely having trouble, she could get the feet out but I saw no hint of the head so I figured the head was back and we were in definite trouble. We ran home and got the saddles and equipment to pull a calf out, went back and got the horses in and took off to get her in. 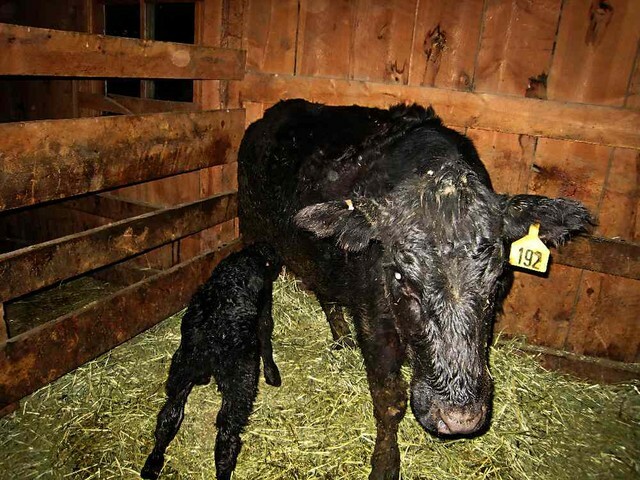 We found her sure enough, standing over a brand new baby calf. Sher wasn't in trouble at all, just took a long time to calve. All the time we were out getting stuff and getting her in sure shot my plans for the day but better to make sure their is not a problem than lose a cow. She sure fooled me. I see by the paper that Billings had a nice little snow storm. I had been watching the weather and knew the storm was coming and was hopeful and dreading it both at the same time. A nasty storm while calving is always difficult but the moisture sure would have been nice. As it turns out there was no worries. We only got a light skiff of snow here. I haven't managed any pictures of it but here is an older one that gives the idea of how much snow we had, just a skiff. More moisture out of the storm would have been nice but that's not the way it worked out. Well, there is a lot of spring left and more moisture will come to help us out. I have to believe that or I will go nuts worrying about it. Billings and west of there appears to have gotten a nice shot of moisture. I am glad since they were drier than I am here they needed it. Enjoy.